Li'l Brrs, originally known as Ice Bubbles, are enemies in Super Mario Galaxy and its sequel, Super Mario Galaxy 2. Their name is a direct reference to the common interjection used for being cold ("brr"). They are the ice counterparts of Li'l Cinders. Li'l Brrs attempt to ram into Mario and freeze him, inflicting damage. To defeat one, Mario must use a spin or shoot a Star Bit to put out the ice cloud surrounding the enemy, causing it to fall to the ground stunned and allowing the player to kick it, releasing one coin. If the player is not quick to hit the Li'l Brr while it is vulnerable, it starts to hop around, attempting to jump into icy water and regenerate its ice cloud. Icy water does not appear in the sequel, so it takes longer for a Li'l Brr to regenerate on ice or snow. 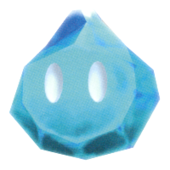 In Super Mario Galaxy, Ice Bubbles are mostly found in Freezeflame Galaxy. In Super Mario Galaxy 2, a planetoid in the Battle Belt Galaxy is also shaped like a giant Li'l Brr. Kachikochi A romanization of 「アイスメラメラ」, meaning "Ice Cinder"
Related to Japanese word kachikachi , "frozen". ↑ Black, Fletcher. Super Mario Galaxy PRIMA Official Game Guide. Pages 180, 181, 188. This page was last edited on February 8, 2019, at 13:19.